The black hole, neutron star and white dwarf are bugged as mentioned above. And what about planets illuminated by globular clusters stars ? I am not an expert but wouldn't all this be very resource intensive? Wouldn't it be simpler to calculate a global illumination parameter based on the position of a non light emitting object in the universe? Fantastic work!!! Patch 4 runs so silky smooth it's ridiculous. I even average 122fps with all orbits turned on. It's to bad I slashed my Cornea doing yard work the other day. But from what little my eyes are able to take I'm very impressed. It's to bad I slashed my Cornea doing yard work the other day. Even then most are not very bright. Volcanoes are very broken in 0.974. Like this one.. Probably isn't stable in this gravity. Also tidal heating and volcanism aren't removing craters like they did in 0.973. Sufficiently high temperatures i.e. 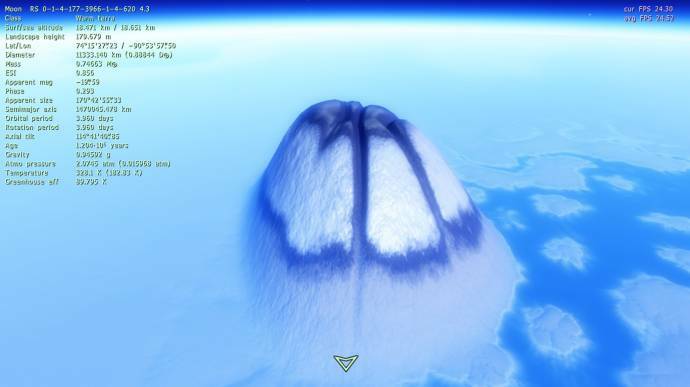 abouve about 1500k are removing craters but volcanism is not removing like it should. I've heard in many places that large nebulae, when inside them, the total brightness can be as bright or brighter than a full moon, and trust me I've seen many nights where the full moon casts very clear shadows. now they'd be much more diffuse, meaning "shadows" wouldn't really happen, but the ambient lighting would be about the same. I don't think that matters. You can if you want to have multiple versions on your computer. Couldn't hurt. That's what I've done, and there no problems whatsoever. Where did you hear that? Also, it would strongly depend on the nebula. The majority of nebulae are not very bright. And yes, I understand it depends on the nebula, as old planetary nebulae are obviously not going to be as bright as, say, being in the brightest central part of the Orion nebula, since it is younger and gas for light to reflect off of is still plentiful, plus it has more stars than a planetary. I read all about this in an old issue of Sky & Telescope magazine. Also they mentioned that you wouldn't see all of those colors as in the photographs as well, only some of those colors you would see. In a telescope most nebula has the color of grey to a greenish blue in color.